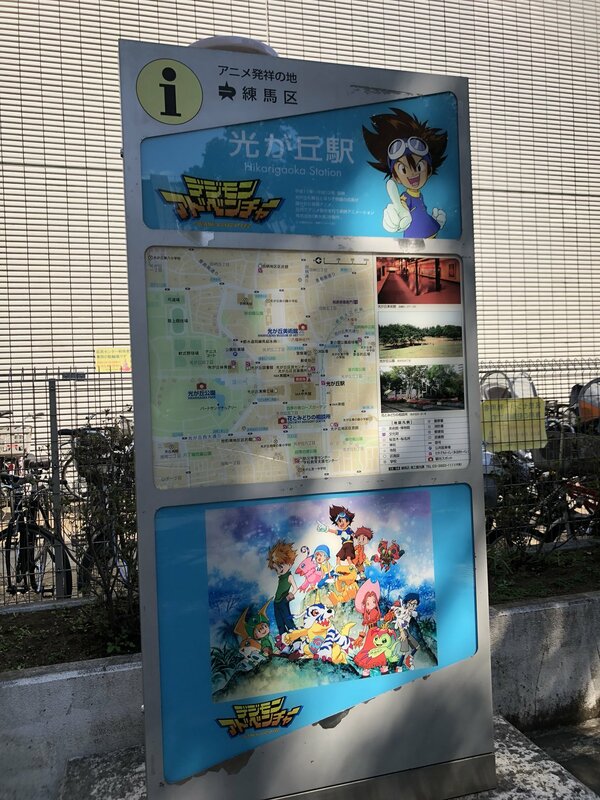 The Hikarigaoka Station guide sign has long been a location of interest to Digimon fans, having had Digimon Adventure imagery in it since around when Adventure originally ran. Over 20 years, time has not been kind to the sign. Peeling paint and dirt on the metal work, rust, the acrylic protectors getting gunked up, and the Adventure displays themselves fading due to being in the sun constantly over 2 decades lead to it being a nice little memorial for fans of the shows original run and a noted location from the show itself, but overall, it's heavily shown it's age and has long since looked borderline abandoned. 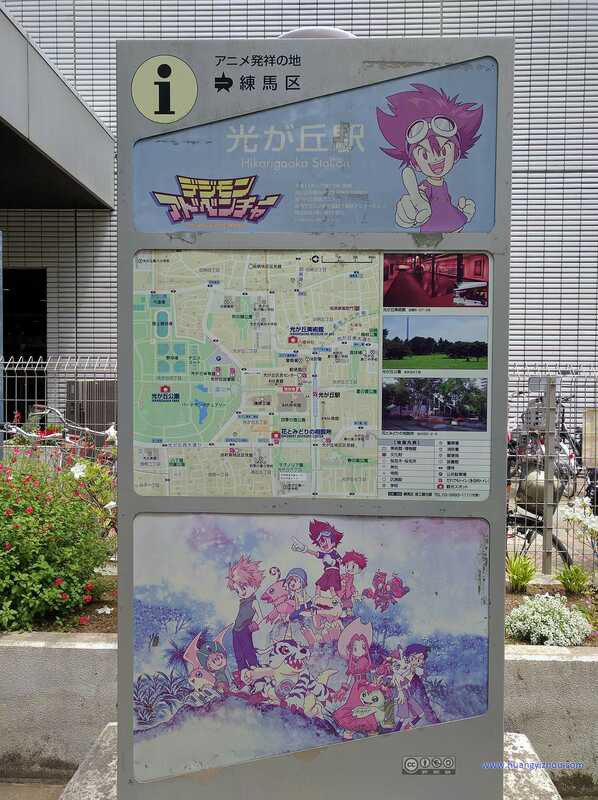 It appears someone agreed (likely whatever government/local entity deals with sign displays and Toei) and has renovated and refreshed the display entirely. The display hasn't been repainted, but they've peeled down the areas that had paint peeling so there wasn't anymore fraying paint (which should hopefully lead to less fraying in years to come), polished up the bare metal showing thru in places, along with getting rid of the rust and giving the frame a good cleaning! The acrylic protectors have been replaced with new clean ones AND the art has been replaced. The replacement art on the top appears to be identical to the old one, down to the same font, likely printed from the same files as the original, while the bottom uses the same key art image, but frames it with the same blue color, and adds a Digimon Adventure logo. The image above, from just a day or so ago shows the newly refreshed sign, but a semi-recent shot of what it looked like prior might help to see just how much nicer it looks now! This nice image from May 2017, just 2 years ago, shows the recent condition of the sign prior to this new refreshing. An overall nice touch is that even with the tweak to how the art display is at the bottom, nothing has really been 'removed', it's just a significantly cleaned up version of what has sat there for 20 years. With the 20th Anniversary in swing, and all of us excited about the film, collaborations, etc. that a small nice touch was done, and it'll be interesting to see what other stuff like this might happen! Thanks to Digisoul for the heads up, hui_lijia_ for the refreshed photo, and huangyizhou for the 2017 photo. Yes!!! I'll be personally checking it out in couple of months!! Glad it got a refresh. I wish they hadn't framed the bottom image the way they did though, the square blue frame really doesn't mesh with that slant metal frame. Too bad I didn't get to visit this when I went to Japan a couple years ago. My friend's visiting there right now though, maybe I should have him take a pic lol. I'm happy that its being preserved. It was one of the highlights of my trip to Hikarigaoka and Odaiba for the Memorial on August 1st in 2013. Hikarigaoka is beautiful and seeing the information board here was a special moment for me.